We all know what an amazing tool the internet can be for unknown artists to get their music heard by more than just their mates, and with the help of netlabels, social networks, and blogs, everyone has a fair chance at being discovered by the right set of ears. But sometimes all it takes is 1 simple link. Case-in-point: The Monarch. 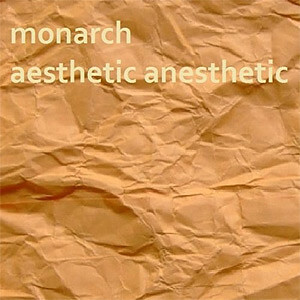 Monarch - Aesthetic Anesthetic is exactly that; funky, synth soaked acid composed with vintage hardware including classic Roland drum machines and keyboards. "Melo Velocet" kicks the album off with funk for sure, and right off the bat displays excellent pattern progression, build ups, break downs, and smooth production that would get any braindancer up out of their seat. Surely this can't be the work of a newcomer? As track 2 "45" kicks in I'm starting to realize Monarch is using a Roland TR-727 drum machine, the 707's less popular Latin cousin, and it's totally grooving. Suddenly the synthy bassline in "Siamese" sounds really familiar and I can't help feeling a small suspicion creeping in that perhaps Monarch is a side project of someone we already know and love. This of course is pure speculation and the album is great fun regardless of who the artist actually is, but I can't help but notice a similarity of styles as well as a few clues left behind in the comments of the above mentioned a&d article. Monarch appears to want to remain anonymous as there is no official site, Facebook page, Twitter account, blog mentions or even a search result to be found, so I'll refrain from saying who I think it is. As an aside, the album's metadata lists the artist as "The Monarch", perhaps to avoid confusion with a few other bands and musicians going by the same name. You be the judge. Excluding the horribly generic album art, Aesthetic Anesthetic is a solid album chock full of quality tangible "a&d", and if funky basslines, clever melodies, upbeat tempos and attentively programmed percussion is your thing, I recommend you grab it. Highlights for me include the modulated bassline in "Quest To The Off Start End", the Plaid-esque bells in "Tea", the drum machine solo at the end of "Network Cycle How" and the eerie, dissonant feel of "Tricaclaic". Despite have no internet presence whatsoever, Monarch is now in my collection and on my radar, all thanks to one simple link in the comments section of a random article on the internet. Connect with Monarch? :: MySpace?